When I began the process of selling my home several months ago, I asked a Realtor to come over and assess the situation. We talked marketing and the best time to list and then we walked around my house and he gave me ideas for “staging”. 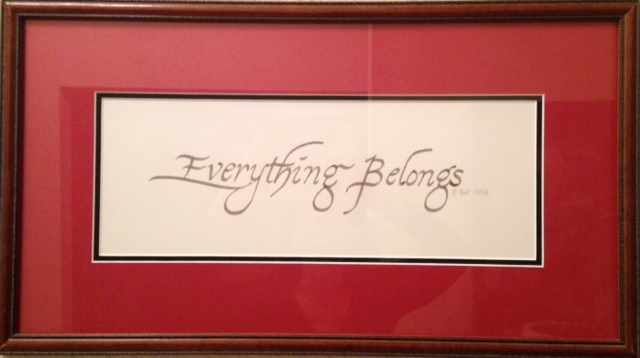 And then he stopped in his tracks at this framed quote on my wall- “Everything Belongs”. Everything Belongs. A quote from Richard Rohr, a Franciscan priest who advocates for living simply so that others might simply live. A reminder to me every time I walked from my kitchen to the front door that no matter what happens in my life, it all belongs. This morning I am up early to do some last minute packing. I am having my coffee on the floor of my office. No desk. No chair. No potted blooming orchid. The excitement of the next chapter. The heartache. The anticipation. The moist fragrant morning garden. The anxiety. The hopefulness. I take it all with me. The lessons learned in this beautiful home and the woman that I’ve become in the last 17 years- those things can never be left behind. And tonight when I revisit my beautiful home in my dreams, I will remind myself. That life changes and the lessons continue and I take it all with me. And not one experience in life is out of step or out of sync with the other. And the future is ripe for new experiences, new gardens to plant, new people to meet and new lessons to learn. And in some unpredictable and unexpected way, it all belongs. Imagine my surprise when a couple months ago, her sons now graduated from high school, I spotted a big fat For Sale sign on her property. Now they are gone- to where I have no idea. Since her sons were old enough to travel the neighborhood independently, our only communication was a wave as I drove by her house. She was usually outside meticulously manicuring her yard and garden and/or washing down the entire street in front of her house in her bathrobe. 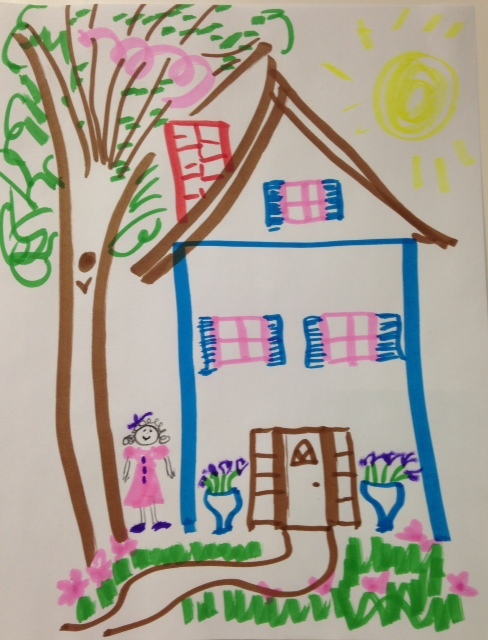 In my quest to “let go” in 2015, I threw away all my notes and paraphenalia from graduate school, including my very first House, Tree, Person drawing. But it doesn’t really matter. Every one I’ve ever drawn looks just like this one. I did this the other day sitting at my kitchen table. You might ask if this is my “dream house”. Not really. I think I’m the only woman on earth who has never longed for her “dream house”. Rather, I have many houses that I dream about. Shortly after we moved from sunny California to Portland Oregon, my son Patrick, then 9 years old, had a vivid dream about our family home we had sadly left behind. He was outside playing with his brothers and the neighborhood kids with squirt guns. Out of water, he attempted to charge into the kitchen for a refill but found the front door locked. A stranger opened it and promptly announced “you don’t live here any more”. Pausing here for a brief meltdown. I grew up on Halo Drive in Compton, California. I had my babies on Tedemory Drive in Whittier. I sent my first son to high school from SE 31st Street in Portland, Oregon. And I launched all three of them into adulthood from my current home on Del Monte Avenue. Each house was a “dream house” to me because the people I loved the most made it just that. And in each house, a part of me was projected on to the walls and floors and empty spaces as my own personality and inner being grew and developed, magically displayed like a crayon drawing on a clean white piece of linen paper. I’m moving, downsizing, cleaning, sorting and putting up for sale once again a house I will someday dream about. I’m feeling both excited and sad and several other emotions in between. But I am holding the tension of the opposites deep within as I go through this process. It’s time to make a change, to grow in a new direction, to take a chance, to redirect the energy in my life. It will be a bittersweet journey. I will take this home with me. Every house I’ve ever lived in has taken up permanent residence in my heart and soul, carefully placed on my own personal Street of Dreams. And I can revisit them any time I like. This last weekend I had the opportunity to facilitate a Day of Reflection for AMEN- The Alumni Mothers Extended Network for Bellarmine College Prep, the high school where my three sons attended and thrived. I was sort of a replacement gig. Sister Rebecca Shinas, better known as “the rockin’ nun of MySpace”, had some urgent family business to attend to. So, my friend, Rosemary, had the thought to ask me. Wondering if I was equipped to replace a sister who has devoted her entire life to spirituality and celibacy, I was hesitant to accept. I remember when Rosemary called me to ask. I was standing in my kitchen and as she set up the invitation my head was telling me NO and my heart and intuition were screaming YES! YOU CAN DO THIS! BE BRAVE! After a month of pulling books off my bookshelf and pouring over underlined and highlighted paragraphs, searching through my journals for significant dreams, scanning TED talks for presentations on life after raising a family, and searching the web for 10 ways to find your passion, I had my script and I was armed and ready.. perhaps dangerous. I met some incredible women and of course the better part of the day was spent with their personal sharing. One thing I’ve learned from being Catholic and having to listen to priests talk from the pulpit every week and not being able to raise my hand and add my two cents is that women want to talk! They want to share, to ask, to unfold their insecurities in a safe place and gain wisdom and strength from other women. I was fortunate to be the facilitator for this day. But truly the best material came from the gaggle of courageous and forthright women who attended. So Amen to all of us! We are brave. We are courageous. We are seeking answers. We are finding our path. What fruit will come from this day together is yet to be determined. In the meantime, I promised to post the resources I referenced for my talk. Some of them are pretty dated but really.. how much does this wisdom change over the years? Ban Breathnach, Sarah. Simple Abundance: A Daybook of Comfort and Joy. New York: Warner Books, Inc., 1995. Something More. Excavating Your Authentic Self. New York: Warner Books, Inc., 1998. Bridges, William. The Way of Transition. Embracing Life’s Most Difficult Moments. New York: Perseus Publishing, 2001. Cameron, Julia. The Artist’s Way. A Spiritual Path to Higher Creativity. New York: G.P. Putnam’s Sons, 1992. The Vein of Gold. A Journey to Your Creative Heart. New York: Penguin Putnam, Inc, 1996. McCauley, Lucy; Carlson, Amy G.; and Leo, Jennifer. A Woman’s Path. Women’s Best Spiritual Travel Writing. San Francisco: Publishers Group West, 2003. Carter, Cherie-Scott, PhD. If Life is a Game, These are the Rules. Ten Rules for Being Human. New York: Broadway Books, 1998. Hendricks, Gay, PhD. A Year of Living Consciously. 365 Daily Inspirations for Creating a Life of Passion and Purpose. San Francisco: Harper/Collins Publishers, 1998. Hendricks, Gay, PhD. & Hendricks, Kathlyn, PhD. Conscious Loving. The Journey to Co-Commitment. A Way to Be Fully Together Without Giving Up Yourself. New York: Bantam Books, 1992. Livingston, Gordon, M.D. Too Soon Old, Too Late Smart. Thirty True Things You Need to Know Now. New York: Marlowe & Company, 2004. Martz, Sandra. The Tie That Binds. A Collection of Writings about Fathers & Daughters, Mothers & Sons. Watsonville, California: Paper-Mache Press, 1992. Rupp, Joyce, OSM. Praying Our Goodbyes. Notre Dame, Indiana: Ave Maria Press, 1993. Viorst, Judith. Necessary Losses. The Loves, Illusions, Dependencies and Impossible Expectations That All of Us Have to Give Up in Order to Grow. New York: Ballantine Books, 1986. That wonderful 80 year old therapist who has her office on the Alameda? Email me and I’ll send you her information. 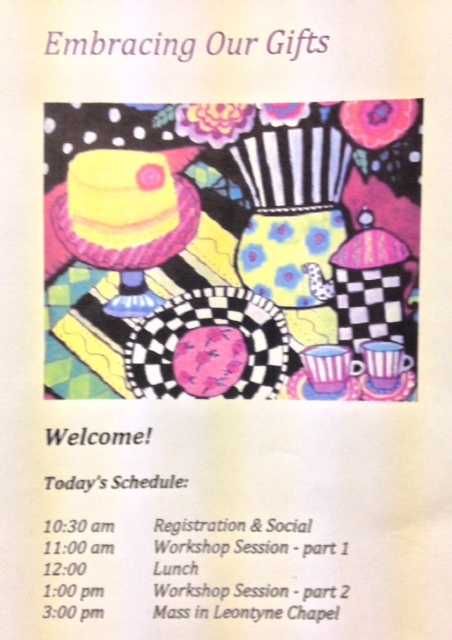 Thank you, ladies, for being such attentive and engaged participants! Until we meet again..